Winter weather is here again and my thoughts turn to dreams of lush, brightly colored landscapes, afloat with perennials, shrubs, and flowing water. I have known many landscapes through my work in Kansas and Nebraska, but none have seemed quite complete without a water feature. 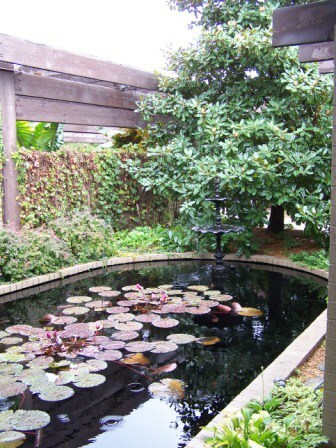 Water can be displayed in many forms, from large, open ponds to tiny trickle fountains. Not every landscape needs a large koi pond, but I do believe every landscape needs a water element in it. A formal feature becomes an instant focal point. Providing a birdbath doesn’t count unless the water is moving. Humans and animals alike are attracted to the sounds of splashing water. 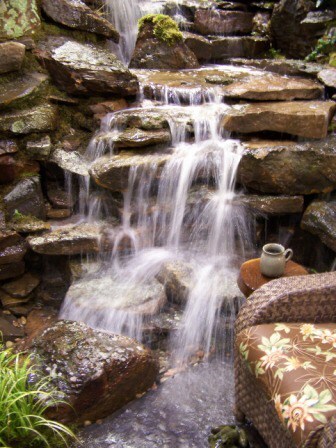 By adding a fountain or a pondless waterfall, we can create those sounds our ears long for. The true secret to adding a water feature in a landscape is to surround it with lush plantings and a backdrop of shrubs or trees. I have come across several pondless waterfalls (a pondless waterfall is just as it sounds – the falls run into an underground container, where the water is re-circled via a pump) with poor plantings, little or no softening of the hard stone, and no detectable backdrop. Backdrop plantings are such that showcase the feature and hide what is behind. Evergreens, trees, and large shrubs can be used as a backdrop all year long. Enhancement plants provide color and interest that help draw your eyes to the feature. They may add scents or colors that enliven us. Softener plants smooth and soften the hard surfaces of the boulders with their small leaves and arching stems. 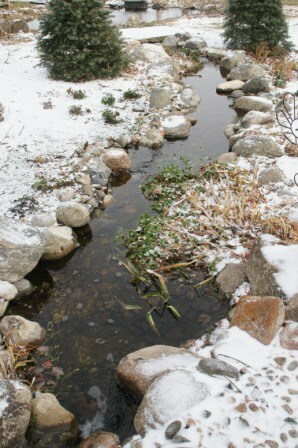 Natural streams add interest all year long. When we install these wonderful features into our yards, we expect them to blend in and take a firm hold as a focal point. However, many of us also have memories of cascades and riffles from past vacations in Colorado or the mountains, where we seek out these natural formations. We too often want the same from the ones we build, forgetting that Colorado boulders and river rock really have no place in the Great Plains. Consider using limestone, red granite, or other rock that is native to your location. 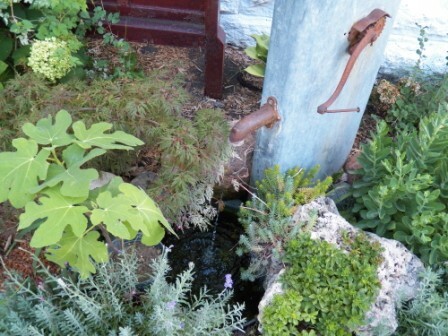 The key to having your water and gaining that sense of peacefulness is in the plantings and location of the feature. If you put a bubble rock near your house and expect it to remind you of water trickling out in the hills of northern Arkansas, then you better have log cabin siding on your house. Just adding water is not enough; you have to integrate it into the landscape in such a way that it becomes a permanent resident rather than a stranger sitting amongst your burning bushes and forsythias. One way of doing this is to locate it where it gets the best views from the house, among plants that mimic the feel of where you want to be. Another is to locate it in a place that receives many viewers, such as the entryway. Fountains can be anything from an old well pump to a circle of five bored basalt columns bubbling water. Most water features tend to have a lot of boulders and rock, which require a softening of the heaviness, via the use of flowing plants and flowers. Many times, designers overuse plants from the regular landscape to try and soften the stone, such is the case with Siberian iris and catmint. While these plants can look great alone or in a grouping in the landscape, they and others often will deter from the beauty of the water feature if used too much. Your water feature doesn’t need to be a giant. Even a small fountain can add the sound your ears long for. Another thing to remember when putting together a plan for a waterscape is the extra elements everyone loves to add. While gazing balls and garden gnomes may have a place in your landscape, they just do not seem to tie in with the water feature. The use of hollow logs and water worn branches can increase the interest and beauty of the feature. Do not add bird feeders too close to the feature, unless you want to be constantly cleaning filters. Instead, plant viburnums, hollies, and coneflowers – the birds will come in for a drink and stay for supper! The following table is a list of plants that can help soften, backdrop, or enhance a water feature, when used properly. Many of these plants are already used in landscapes, just not overused. Shape and form are also very important in landscapes, especially around water. If you are interested in adding a water element to your landscape, contact Grimm’s Gardens for an estimate and a personal touch.